The Enicar Watch Company was founded 1913 in La Chaux de Fonds Switzerland when Artiste Racine (Racine Watch Co.) spelled his name backwards and created a timeless brand that has been recognized for its high quality in over 90 years. When production of watches increased in 1914 mostly due to the successful export to Russia. Racine were among the first to use Radium in 1914 as a way to make his watch hands and dials readable in the dark. Due to the fast success and the associated expansion of the firm in the mid 20's it was moved to Lengnau, here the firm started making their own movements instead of using ones from Adolphe Schild (AS). Racine focused this time on the production of both precise and robust military watches, which were soon recognized by civilian costumers under the name "sport". From the mid-forties Enicar developed its first chronograph models. In the sixties and seventies they developed their own automatic movements and focused mainly on the sport watches. 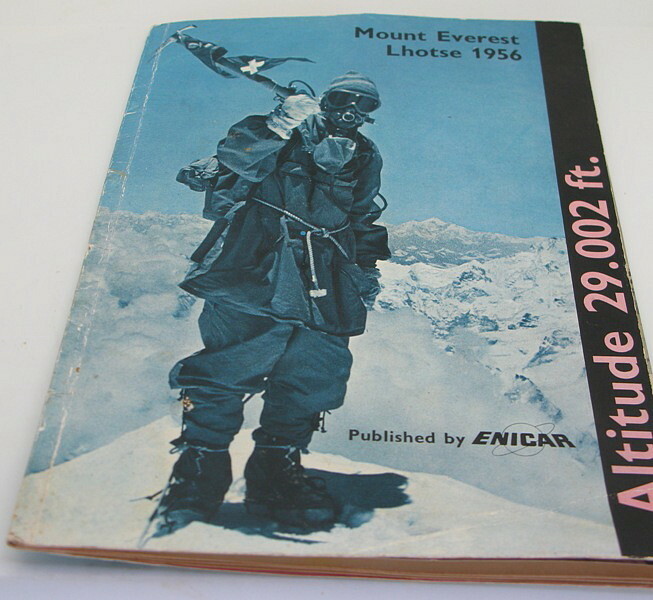 One of their more successful models were the "Sherpa" (an analogy to unusually reliable and resilient local carriers of the expedition) and were named after the 1956 Swiss Himalayan expedition to Everest which relied on Enicar timepieces (more exact the expedition members were all wearing Enicar Seapearl watches) that could withstand the harsh climate of the mountain. With the breakthrough of the Sherpa models, the Enicar company began their "golden years". 1957 Enicar made headlines as a chronometer (the Ultrasonic Sherpa) were attached to the helm of the ship Mayflower II, this voyage was an Atlantic crossing of 50 days and the watch survived without any mechanical problems or leakage. Important developments and designs from Enicar would be the front line for the next 1 1/2 decades of watchmaking in the world. In the 1950ies Enicar had the slogan: "Precision time in space, on the earth and over the seas"
Some say that Enicar was the first watch ever to been taken to the top of Everest and not the Rolex Oyster that Sir Edmund Hillary worn on his expedition in 1953. Because of the expedition not being documented properly Enicar could not claim to be the first to the top and tried again with the team of 1956. Enicar also produced other varied "sports models" models including Sherpa Ops for military use and the Sherpa Super Dive for diving. 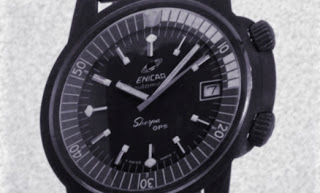 The Enicar Sherpa Dive was rated water resistant to 200 meters due to its patented back, which was equipped with a bayonet socket. The bezel was oil-embedded which guaranteed a long lifetime and watertight seal. A very special watch was the Enicar ultrasonic Healthways 100 fathom. 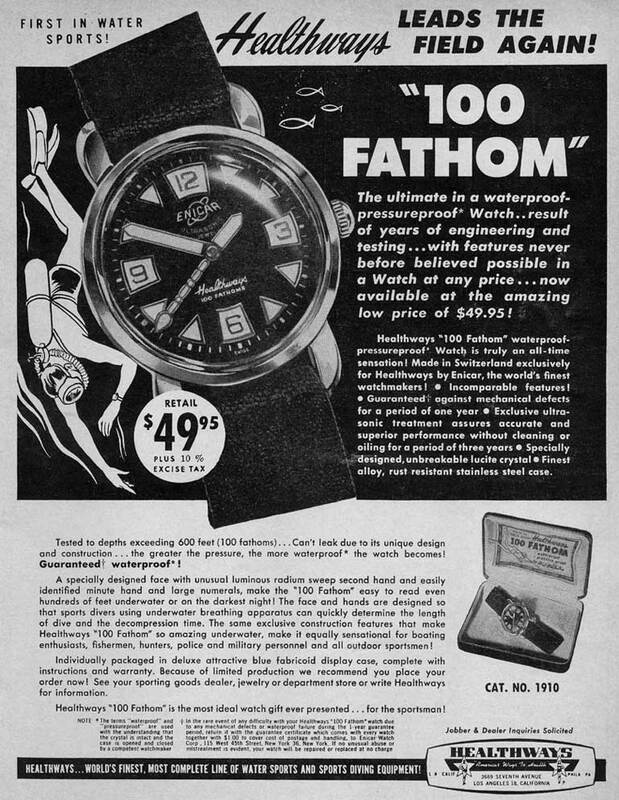 This watch was tested to withstand 100 fathoms, 600 feet or 180 meters and as the ad says "Can´t leak due to it´s unique design and construction....the greater the pressure, the more waterproof the watch becomes!". This watch is one of the most popular Enicar watches among collectors. The name "Ultrasonic" were used on almost all of the Enicar watches from 1953 and forward when a high tech laboratory were opened that ultrasonically cleaned all of the movements produced. The Enicar company struggled to survive when the electric watch boom of cheap Asian watch brands hit the market and finally went bankrupt in 1988. This Enicar Star jewels is from the sixties and has a white colored dial with white illuminating hands. The second hand has an red dot that gives this watch a nice look. 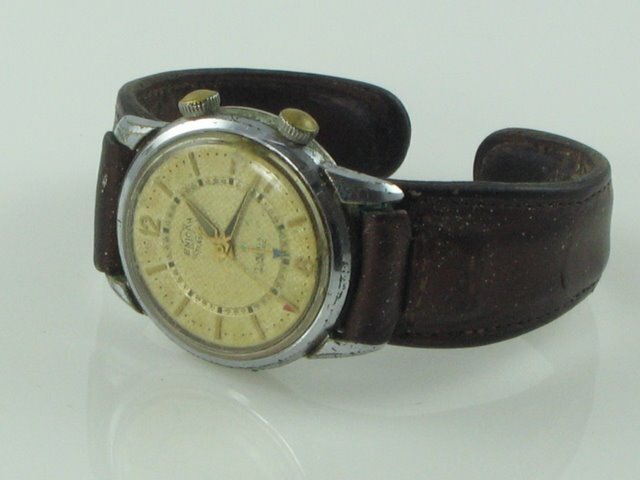 Enicar also made alarm watches like this one from the 40ies. Its a rare watch that i guess had a white dial from the beginning and uses an extra crown to set the alarm time. The second hand has a red arrow at the font and the alarm setting hand has a blue arrow. The case of the watch is in pretty bad shape and as you can see the crowns been worn down and are now missing the Enicar logo. I have never seen another model like the one I have. If you brows the net you can easily come across the "Indian" Enicars. These watches has dials thats been repainted, movements thats been "readjusted and repaired" and also cases that doesn't fit with the case back at all, like the one I bought from an Indian dealer on eBay. Excellent product. That is a really good idea. The benifits of Enicar is that it works as well as in space on earth and all over the seas. Thanks for this comment. I never knew Enicar is a great watch, if their claim is true, that its the first watch to reach the top of Mt. Everest! Yes of course Its possible that Its a fake. But I think Its more possible that Its just a repaint and the rest of the watch is original but polished. It is good to read these news! Cases can be easily "refreshed" with a new chrome plating, but the lost Enicar logo on the cnrome crowns will always be a big loss. I have now two models, an automatic alarm (AS 5008 movement), and a Sherpa guide (44mm...), in th epast years I had a simple alarm (AS 1931 wit date), and several automatic and hand-wound ones. Indian ones, if the dial is original, than usually tha case is also OK, but I also met with the caseback problem once. In 1955 or 1956, I bought an Enicar dress watch, ultrasonic at the Loring AFB Base Exchange. It is a dress watch with originalgold plate & leather strech band. I gave it to my dad for his birthday. He loved it but would only wear it on special occasions. He passed 19 1976 and the watch was misplaced for the next 35 years when it was returned to me in near mint condition. It keeps near perfect time, runs flawlessly and has yet to be cleaned! What a gem!! One more comment about my dad's old watch, the 1955 or 1956 "Enicar"> I will have it cleaned, oiled and adjusted soon. I own several high grade watches including Rolex,Patek, Tiffany etc., but this watch is a much better time keeper than any of the Rolexes. I paid the astounding price of $35.00 for it, but that was when good dress watches were noticed, unlike today when imitation Rolex pieces and other junk watches have flooded the market. I have a Enicar mens wristwatch which,from the style,would probably be from 1930/40's.It is a very accurate timekeeper.Apart from the Enicar logo on the face and the movement stating that it is Swiss 15 jewel there is the number 46 on the back plate.I wrote to Enicar to ask if they would enlighten me on the appreoximate age of the watch but they said that they could not. Any ideas? I have an Enicar watch from Dad. I think he would have purchased it in the early 1960's or late 1950's. On the back is 1064-12-CR on the face is 17 jewels two toned black and gold face. After all these years it still works. Can you tell me a little bit about the watch? Its no use contacting the Enicar company. They have no records of old models because they only purchased the Brand Enicar. Today the make lesser watches with poor quality compared to the ones of old. Your dads "1064-12-CR" Enicar is probably from 1955, it has an AR1292 movement. Its a manual wind with a sub second hand. I cant say more I would need a picture of it. Its a very good and accurate movement that will keep on going for a long time if you service it now and then. I have a Sea pearl manual wind ENICAR watch, with gold plated case with, champagne dial with the 3-6-9-12 figures. I have never seen similar around. Could you give some more infos about this watch ? Im sorry to say that you give me to little information to go on, I at least need to know what the watch says on the back. In the middle : ENICAR and the serial number. I post it again. I have an ENICAR wristwatch gold case manual winding, no date with 3, 6, 9, 12 around and the write INCABLOC on the dial. leather strip. Any further informations about it ? I'm sorry to say that I cant fully identify your watch, It would be helpful if you could see the model of the movement (you would have to open the back to see it). I can say that it sounds like a common model of a 50ies enicar with the bayonet mount case back that Enicar used on many of their watches to secure the back from water. I hope it was some help. I get it opened, as you suggested. I took a picture. Where can I send it to have your professional advice ? You can email me at cliffmaister@gmail.com, the important bit is that the "AR" model number is shown on the picture, its under the balance wheel, (the ting that moves all the time). If you look hard you can see it. Your watch is from 1970-71, its a model of dial that I've seen before and its a very nice watch. 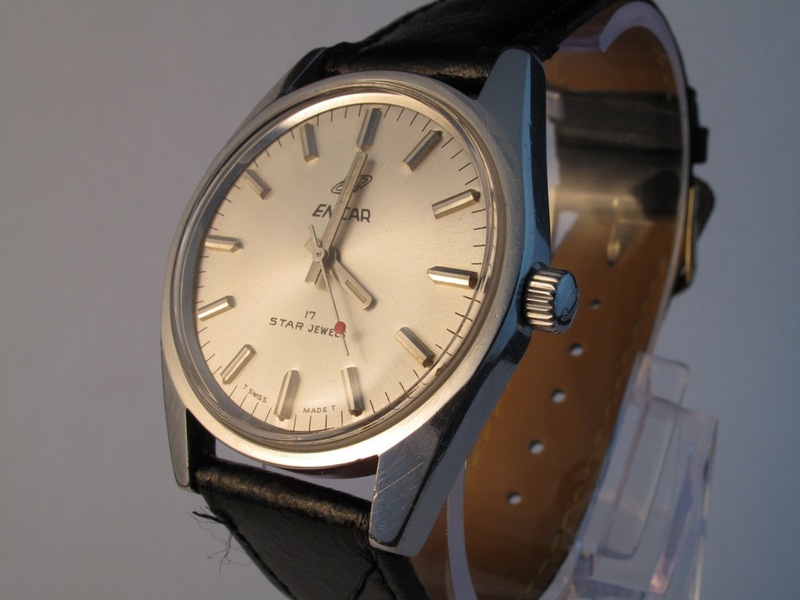 The AR 16xx movement is one of the most used by Enicar in the late 60ies to 70ies. I could be that the case is gold plated, (you can check the case for the microns markings). I would think that the watch ist worth in working and cleaned order about 60-70 dollars which in my opinion is cheep for a timepiece of that caliber! I recently got a beautiful gold-plated Enicar chronograph with Valjoux 72 movement. I've been trying to identify the production year since but it seems to be kind of difficult. Would it be ok if I sent you some pics via e-mail? I have bought an Ocean Pearl star jewels automatic, which has the numbers 144-39-16 in the back. I would Like to know if it has tritium or radium hands and hour marks, as in the dial only Swiss Made is written.The posibility of having radium in my wrist freaks me out! The watch is from the late sixties and it does not have radium hands or radium dial. The production of radium watch parts stop during 1960. 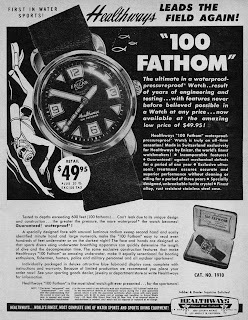 Even if the watch had radium parts it would not be dangerous for you. It is only dangerous if you somehow breathed in the radium dust into your lungs. The watch is Swiss made (Switzerland) by the Enicar Company. It’s hard to say if the watch has been relumed just by watching the pictures you sent, but it seems it hasn't, the condition of the watch is very good, but then again Enicar made great watches the lasts for a long time. Your watchband is not original but it’s a nice one. just send me the pictures and Ill have a look. Hi I have an enicar watch and I would like to know from what year it was and how do you know if its 17 jewels or 25 jewels it doesn't say, it is two toned the dials and the logo is gold.. 955 051 is written at the back and i think its the model number.. can i send you some pictures? Of course, send me your pictures and I´ll take a look. That is a very nice watch you have there. I'm guessing its from the 1960ies, its a tachymeter/chronograph. Which means that it can measure time and speed. I'm not sure of the movement but if its the same as on the Enicar Sherpa Graph its a Valjoux 72 movement. I haven't seen your particular watch before but i think that it might be worth some money, perhaps 100-150 dollars. Hi, Sorry for botherin you, but i see your comments have become something o an Enicar encylopedia. I recently inherited my grandfathers Enicar watch. On the back it's printed 100/67/ACGS, Antimagnetic Incabloc, Swiss made and waterproof automatic. Thi is printed in the "leafes" of a stylized, barely visible clover with the Enicar-logo in the middle. I'mno certain about the first marking, because the wear has made it difficult to make out, There is also an 18K gold stamp. I'd really like to know what movement this has, and when it was made (ca.) if you would happen to have enough information to make a qualified guess. Hi i dont know if anyone will be able to help me my father has given me his Enicar Ultrasonic Gold Watch which he was given when he was 18 by his parents (about 1961) and for insurance reasons i am wondering if anyone would know the value of it? Basic description is:- Gold case, gold coloured dial and hands, manual 17jewels, the Enicar Ultrasonic logo appears below the 12 it has no numbers but has battons (|| and |) to denote the numbers, the back of the case i assume is stainless steel but in the middle of it, it has the Enicar logo inside a resin/glass disc counter sunk into the stainless steel back. I hope someone can give me an idea of the value as i dont want to take a jewellers and them tell me a crock of lies, i dont wish to sell it but want the right amount to insure it. i purchased my enicar in 1966 the same week england won the world cup its a manual wind 17 star jewels 140/028 well worn and still worn and working perfectly. I was just given an enicar watch everything on back says as follows.... incabloc eniflex....seapearl....sherpa 100/120 Bans(I think this is what it says) ...brevet 314962...the band has a callandar tgat now reads july '74 and the face says 17 jewels...can u tell me anything else about it? Sound like your father has given you a very nice watch. But it would help me to help you if you could send me some photos to my mail so that I could look at them for you. I will do my best to help you in any way that I can. In 1967 I was travelling in Europe for the first time and my travels took me to Berne which at that time was the location of many watch factories. I decided to acquire a Swiss watch that I had purchased at the factory. My first choice would not sell direct but the second was Enicar. When they asked what I was looking for I suggested an alarm watch and they were happy to oblige. I still have the watch and it is almost identical to the one on this site except that it did not have a strap as per the photo and the original is long gone. The alarm watch was always costly for cleaning and after a decade or so the watch moved to a souvenier box. I had it overhauled a few months ago as a active souvenier. The watch repair person noted that the crystal was a new space age material at the time: Lexan. hi I have a enicar watch #147-02-01 I sent 2 e mail to the company where to fix the cristal I never had any anser from them are they still in business. Hi !i have a Enicar1064/12 CR. It works very good! Is it a good watch! Thanks! I have an Enicar Ultrasonic that was my Father's from the 50's. Had it serviced a few years ago and it keeps great time. Lovely watch, perfect for formal occaisions. Great reading about the many fond Enicar experiences. 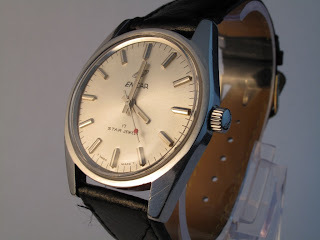 I'm really excited about this blog because I've just got my father's Enicar watch and I do not know too much about it. My father died 25 years ago and since then the watch was in a drawer. It occured to me a month ago and I asked for it from my mother. When I received I thought that it was a cheap watch because I had never heard about this brand before. I was really surprised when I saw the internet that this is a famous brand with really good watches. I would really appreciate if you could send me some details about my watch. My watch was bought by my father around 1975. On the dial I can read the following: Enicar Aqua Graph (on the top), T Swiss (at the bottom under each other with very small letters). On the back in the middle: Sherpa 300 (with a picture), and around: Enicar Ultrasonic Brevet+ 314962 Sherpa Stainless Steel Incabloc Swiss; and under all: 072-02-02 A. I sent some pictures to you via email. I hope you received them. If not please let me know. Anyone with the slightest interest in watches knows for a fact that the first wristwatch on the top of Mount Everest was a Smiths worn by Hilary. I have seen a ENICAR STAR JEWELS watch for sale black face, but does not have the saturn emblem above the name enacar on the face, was this sometimes the case? it is not a watch from india. I bought my first watch Enicar when I started work in 1973. It is rectangular with a dark face. It has Enicar logo on the front and back, with marking 516. It still works. Can you throw some light on the Enicar ladies watches? I have an Enicar seapearl watch from the 60s. It is a very good timekeeper. Enicar is underrated, it is a high quality brand. Any idea what the logo is? a planet or the moon? My dad bought me a gold plated Enicar watch in 1969 when I was 21. Sadly he died the following year when he was 73. So I have a strong connection with the watch which I have worn every day since. It has never stopped working and has never had to be mended. It may have been cleaned once or twice however. We were on The QM2 transatlantic in November 2014 and 5 minutes before we disembarked in New York the plastic face fell off. 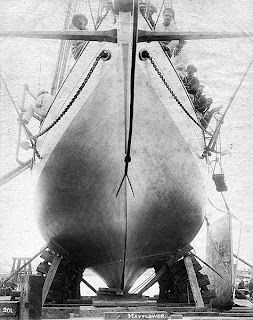 It had been Force 8 throughout the voyage so the movement of the ship probably loosened it! It doesn't look great with sellotape. From which year to which year .Enicar star jewel on production? Is any black dial model without red dot on second .? I have an Enicar Ocean Pearl watch given to me. I am curious about the numbers on the back face. 144-39-06 Does this give any idea of the age of this watch? Any info would be helpful and thanks for your website. We have a gold ladies enicar 17 jewel bracelet watch with p1400 and plaque or 20 microns engraved into the back of it...can you tell me anything about it? It still works. Hi i purchased a Enicar 23j Seapearl in nearly new condition with original crown and Enicar strap. I can't seem to find any information about the piece i have. It has small second hand at 6 on dial what is cream colour. The serial numbers are 100/143B. Brevet+314962. If anyone can help with approx age and what caliber ect would be greatly appreciated. I am very fond of Breitling Watches because When I wear it then I feel much more comfortable then others watches.The company make different brands of breitling watch at an affordable prices. I am after some information on an Enicar watch. It belonged to my dad who died in 1987, it is gold coloured and says on the dial Enicar ultrasonic 17 jewels. There are no numbers on the dial just gold lines at every hour mark and a double line for the 12 o'clock position. It also has a second hand between the six o'clock position and the centre of the dial with a domed like glass, the face is an off white with an almost textured look. On the back it says antimagnetic Swiss and 100/142 with an L and another letter that could be a P or R it's hard to tell. DOWNLOAD $12,234 in 2 months Casino ROBOT? I don't care about sports. Shame on me but I don't even know the baseball rules. I tried EVERYTHING from FOREX & stocks to internet marketing and affiliate networks.. I even made some money but then lost it all when the stock market went south. I think I finally found it. Check It Out Today!!! Start following our signals NOW & gain up to 270% per day. My motto is “if it’s broken and cost under 50 euros, try repairing it!” it’s always worth a try. Even if I buy watches with intent to sell them I usually never do. This blog is a way for me to keep track of the watches I buy and what I do with them, so you can say that it is mainly for me but I hope other people will enjoy it to.